High quality and good design last forever. 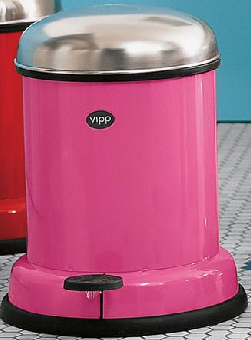 Since 1939, Vipp, known for flawless quality and sleek good looks, has been manufacturing this timeless pedal bin of electroplated and stainless steel with removable metal liner. (And some of the originals are still in use!) Toilet cleaner with sturdy, replaceable bristle brush is discreetly hidden in a matching container. A coordinating soap dispenser is also available. All products are corosion resistant and fireproof. Made in Denmark.